While it is not always possible to prevent scarring of deep cuts, there are some things you can do to at least minimize the permanent markings on your skin. It's best to treat the cut the right way from the get go instead of trying to do damage control later. First off all, if you have a deep cut, don't try to treat it yourself. Get yourself to the emergency room or at least your regular doctor. 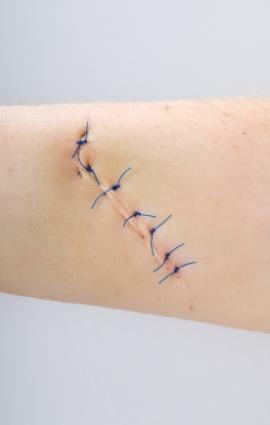 There's a good chance that you will need to get stitches to close the wound up properly. If you don't need stitches, your doctor might give you what's called a butterfly bandage to help push the two edges of the cut back together so your skin can heal more cleanly. Your doctor will then give you advice on treating your wound. It will likely be the steps below. However, if the doctor tells you something different, stick to his or her instructions. Keep the wound covered with gauze or another bandage that allows air to circulate without exposing the cut to dirt. Change the bandage at least twice a day, and any time it gets wet or dirty. Put antibiotic ointment or another cream prescribed by your doctor on the cut to prevent infection. If your wound starts to itch, resist the urge to scratch it. Don't pick at it when it starts to scab over, since you could open it back up again. If you experience extreme itching or pain during the healing process, call your doctor right away. It can be hard to tell right away if a scar will form, since it's created during the healing process. When the body produces collagen to help replace the damaged skin, it sometimes makes too much, resulting in lines or bumps. It can be hard to prevent at least a small line from forming when a cut is very deep, but you can work to keep it from being too noticeable while your skin is still working to repair itself. Once the wound has healed to the point where you no longer have a scab, you can try some treatments to prevent scarring of deep cuts. Health professionals recommend massaging the skin a few times a day in the area where you got the wound. This can help to disrupt collagen bonds before they are visible to you. Another thing to try is silicone sheets, such as Neosporin Scar Solution. You simply apply the self-sticking sheets to the wound site and change them daily. You need to wear the sheets for about one month to see results and 12 weeks to get the full effect. These sheets may be effective on older scars too. If you're currently a smoker, it can also help to quit. Smoking can limit the amount of oxygen that can reach your wound. Eating a healthy diet can also help you heal, since your body will have the nutrients it needs to do its job. Can't Prevent Scarring of Deep Cuts? If your scar prevention practices didn't work, or you want to get rid of an old unsightly scar, you can visit a dermatologist or plastic surgeon. There are many skin resurfacing options available to you.